Tyler Miller, Ohio State University alumnus and current Director of Athletics and Extracurricular Activities at Kings High School, has taken our mission here at the 2nd & 7 Foundation and implemented it at his school with a unique twist we feel is worth sharing! It all began in January 2017, when Tyler discovered that his philosophy of “servant leadership” shared common ground with our mission here at 2nd & 7. Upon this discovery, Tyler partnered with his school’s Student-Athlete Advisory Committee (STAAC), a team made up of students and student-athletes ranging from grades 9-12 at Kings High School who participate in leadership activities in their school and community, and worked to apply our reading program into their classrooms. Fast forward to 2019, and Kings High School’s 2nd & 7 program has flourished beyond belief! Kings’ program currently has a superstar volunteer named Chelsey, a junior at the high school, who has been instrumental in encouraging the growth of their program as chair of the 2nd & 7 chapter. Chelsey is in charge of getting volunteers in their high school and STAAC group to visit nearby elementary schools and read to those classrooms. They visit J.F. Burns Elementary, Kings Mills Elementary, and South Lebanon Elementary for six readings per year. Their group has grown to around 15-16 student-athletes (most of whom are involved in several different programs and activities in their department and school) and they visit 8-10 classrooms during these readings, which enables them to read and talk about the importance of reading and school to about 200 children per visit. Not only do the children benefit by having these incredible role models and experiences, but the student-athletes all leave the classrooms with something as well. By being in this program they are a part of an organization that is about service and paying it forward to young children who look up to them. Tyler feels that it helps develop their social and communication skills while also putting them in a position to see growth in their self-confidence and public speaking proficiencies. 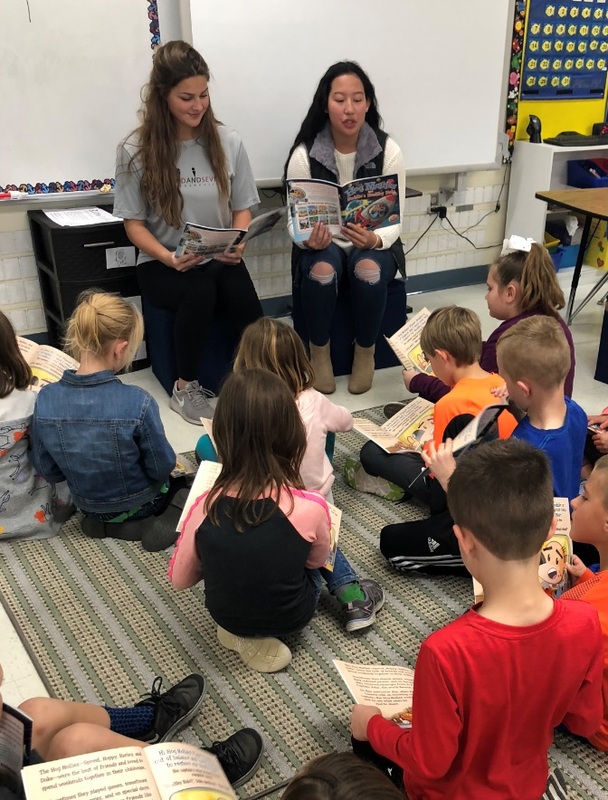 The year ahead looks promising to Tyler and his volunteers, as they plan on continuing their readings and making sure that every child they are able to reach receives a book and has a positive experience with their student-athletes. We admire and appreciate all the work Tyler, Chelsey, and all the student volunteers have put into spreading our mission here at 2nd & 7. These individuals are proof that a single philosophy can have great impact on an entire community once sought out. We are lucky to work with such a group and cannot wait to see the rest of this year through with them!